The apartment is on the second floor of a house from the 17th Century, with a large staircase of carved stone, on the avenue Jean Jaurès. It combines immediate city life and quietness, as Boulevard Gambetta lies on the other side of the building. The 80 m² apartment is divided into two floors and offers an optimum division between the living and sleeping areas. In the lower floor a living and dining area, a 2nd bedroom with 2 single beds (80X200), a modern, fully equipped kitchen with dishwasher, induction hob, oven, MW and Nespresso coffee machine, fridge, freezer, toaster, kettle, washing and drying machine, with a service hatch to the large living and dining room. The living-room comes along with a sofa bed and a home theatre system, as well as a fireplace and a leather rocking chair to relax on. Next to the kitchen is a large bathroom with Italian shower. On the upper floor of the apartment a large, bright bedroom with a large double bed (160X200) and separate toilet. From here you walk right onto the quiet terrace equipped with wooden floor and comfortable seating. A special highlight here is a hot water outdoor shower. The apartment was renovated in 2011 with meticulous attention to detail : stone walls, wrought iron doors, etc. A secure car park is available at a 100-meter walk. In 2015 the region has been internationnally distinguished by UNESCO as a 'world biosphere reserve' (les Gorges du Gardon, Uzès and Nîmes, 9th June 2015). I was born in Belgium where I lived 22 years and studied Law and Business. After a few years in Paris, Africa and Germany I have chosen Uzès as an ideal place to live. I chose this apartment for its terrace and its great central location, and invested a lot in its luxurious renovation. I have personnally lived in this apartment during 6 months. The very pleasant terrace, the very technological equipment, hot water at the outside shower, Nespresso capsules free of charge... what else? The bathroom has a large walk-in (Italian) shower (90X90cm), fully decorated in marble and tadelakt. Large mirror, hairdryer, towels dryer and towels are at your disposal. The bathroom on the 1st Floor has a toilet and a sink with a large mirror. The shower is on the terrace. Big car park 100m away. All urban amenities literally next door (bakery, supermarket, bank, cafe, beauty and fitness center, restaurants, shops, etc.) and tourist attractions as well as the Vallée de L'Eure easy to reach on foot . A short-term parking right outside the front door facilitates loading and unloading. It's in a great location in Uzes - right in the heart of the old city. 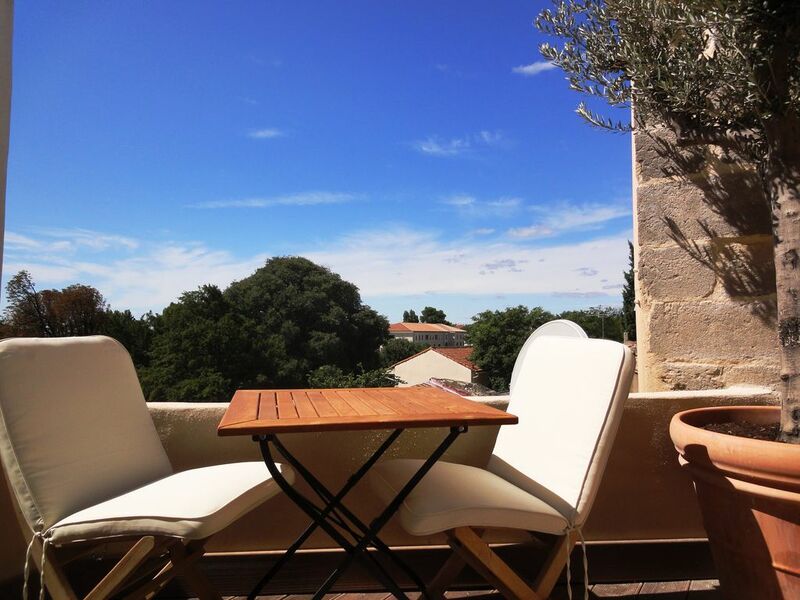 We loved our stay in Uzes and this property was very central to the best the old town offers. The apartment itself is very comfortable and well equipped, although the upstairs main bedroom could be difficult for someone who is not particularly agile since the staircase is very steep. The host Nicolas is very helpful - he speaks a number of languages fluently and is most accessible if you ever need anything. Thoroughly enjoyable time there. Beautiful apartment in a perfect location. My husband and I stayed at this apartment April 19 to May 3, 2018. We loved being steps away from the Saturday market. The market had wonderful vegetables. Lots of other stuff too, but we especially loved the veggies. The location couldn't be better. We walked all over the town. I am giving 4 stars instead of 5 stars as there was no written instruction information. When we arrived, we had been awake about 28 hours. I couldn't concentrate on the information that Nicolas gave us verbally. There is a telephone, but it did not have the phone number on it so we couldn't give it to people to teach us. With email, the phone wasn't a big problem. We never did figure out how to turn on the downstairs TV, no big loss as we aren't big TV watchers. I couldn't figure out how to set the washer/dryer on the dry cycle. A French friend came over to help and she couldn't figure it out either as the words were not in French, maybe Swedish?. I would have liked a booklet with written instructions. Also a book where renters could leave their comments about the things they had enjoyed; side trips, best restaurants bakery, etc. We reached Nicolas easily by phone, better to call then to email. I think parking could be a problem when it gets more crowded. We were lucky and found street parking right down the street from the apartment. On the map from the Tourist Information, it shows more places that are free to park, just a ways away. Parking is costly if you leave your car for 24 hours. I would recommend this apartment to anyone coming to Uzes. The apartment suited us in every way and Nicolas is helpful, charming, and generous! The apartment was centrally located, and contains a number of modern fittings. It is quiet. There is no associated parking, but it is easy to use a pay-parking lot in the vicinity. The greatest negative is that though the apartment is advertised as having airconditioning, only one floor of two has this, and the upper floor was largely uninhabitable during our stay., due to the heat wave conditions at the time. This necessitated use of a sofa in the salon rather than the bedroom. I believe the website details should be more accurately reflective of the correct situation. Thank you for wonderful stay. Can't wait to come back again. Definitely recommended to others. Can't beat the location! The description in ad matches exactly the apartment. As four adults travelling in a France affected by sudden strikes on air and train, dealing with a reliable and efficient owner is the first bonus. Nicolas speaks several languages and is a warm and welcoming host. The location of the apartment can't be beaten - directly opposite one of the key lane ways leading into the Place aux Herbes - but is also very quiet at night. All the reviews about this property are spot on accurate regarding location of boulangerie, supermarket etc. We were also lucky one day and got a free park further up the street, otherwise town parking is 5 mins walk and about 7 euros overnight - we thought this was good compared to other places. There is a 5 minute loading space directly in front which is a bonus for arrival. When we walked in, our first reaction was "'wow - it looks just like the photos" (and who hasn't been caught by that!). The fittings and fixtures such as lighting, bed linen/towels, crockery/cutlery are of good quality and tasteful modern design, with attention paid to detail. The combination of all this and original period details of the apartment such as the sandstone walls make a wonderful first and lasting impression.Beds are super- comfortable (mattresses firm but not the rock hard French type! ), the pillows on the single beds are soft (but low) by Australian standards. We enjoyed dinner and drinks in one evening on the terrace, The loft ladder is steep - so not really suitable for anyone with compromised mobility; but in any case there is plenty of space for 4 adults in the sitting/dining area - and the large window there is ideally placed to enjoy street watching. The Saturday market lining streets and laneways is a minute from the front door and should not be missed. Top quality, quirky, highly recommended. Uzes is a historic town with about 8300 inhabitants and is located between Provence and Cévennes. The romantic town is on a hill and forming a geographical triangle with the cities of Alès (32km), Avignon (40km) and Nimes (22km). The whole city was renovated in 1965 and has a special charm and beauty. Each of the small winding streets in Uzes tells a historical story and transforms the city into a living museum. The centrally located Duchy (castle from the 12th and 18th century) is surrounded by boutiques, cafes and restaurants that invite you to stroll and linger. The adjacent park Vallée de l'Eure, in which is situated the Roman water source for the world famous Pont du Gard aquaduct (UNESCO World Heritage Site) is located a few meters away and offer you a bit of nature and culture in the countryside. The weekly market in Uzes is one of the most beautiful in Provence and attracts numerous visitors every Saturday to offer local delicacies and admire the products of local crafts. In just one hour you can reach the Camargue, the Luberon Mountains and the beautiful sandy beaches of the Mediterranean. Uzes, in addition to the cultural diversity and various recreational activities such as canoeing / kayaking, horseback riding, mountain biking, hiking and cycling. Mietpreis für 2 Personen / Nacht oder Woche inkl. Handtücher, Strom, Wasser, Heizung / Klimaanlage, Internetanschluss und Festnetz-Telefon nach Amerika und Europa sowie ein persönlicher Empfang. Endreinigung für 70 Euro.